Thresher Cove Resort & Dive Centre v Malapascua Island, Filipíny: Zarezervujte nyní! If cancelled within 30 days or no-show then the full booking charge will be forfeit. You may not dive with another dive centre while you stay with us. We ONLY accept group bookings for divers. Each group must contain at least as many people who will dive 1 dive per day, as non divers. 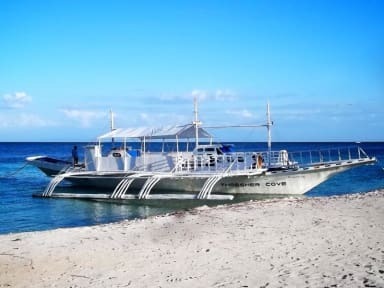 The exception is that we accept non-divers who wish to book a diving experience or course with us. Dive with Thresher Sharks and live in 1.5 Hectares of beautiful private gardens and 100m white-sand beach with large swimming pool, bar, restaurant, outside gym, canoeing, snorkelling, volleyball, pool table and TV room, dorms and luxury rooms. Our dive centre has new equipment and safe boats. Our guides are all certified and the whole operation runs to very high standards. We work to make sure that your experience is both fun and safe. Our resort is walled on 3 sides however we provide 24 hour security for your safety and peace of mind. We have a number of large lockers that will easily take a backpack. Please bring a padlock if you with to use one. Please note: Our dorms are heavily subsidised to encourage people to stay and dive with with us. Because of this you may not dive with another dive centre during that time. If you do, then we may charge you 1200php/day for each day. We have 31 days cancellation policy, failure cancel before that time will result in the full payment will be charged.